Yes, the new Renault Twingo is rear-engined and rear-wheel-drive, and that's fantastic news. 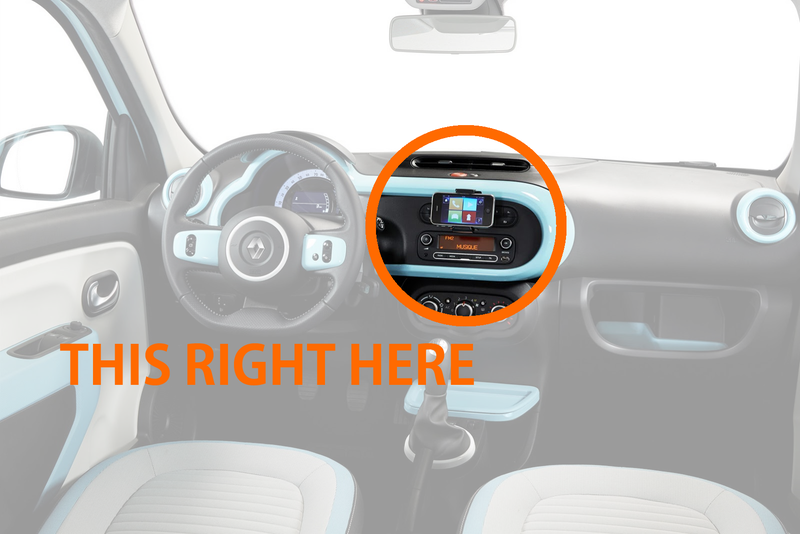 But let's not allow this novelty to distract us from what is, in my mind, the third-generation Twingo's best innovation : its central touchscreen, or rather lack thereof. Allow me to explain : you may have missed it, but in the various press photos that Renault released of their new city car, some models have a central infotainment touchscreen equipped with Renault's own R-Link interface, and some... don't. I assume these are the cheapest ones. But here's the real twist : instead, those models have a conventional radio, and a smartphone clippy thing. What's the big deal with that, you ask ? Well, included in the price of your new Twingo will come a free app, compatible with every smartphone out there (unless you still have a Symbian device, in which case I have bad news for you) that connects with your car and basically replicates the most important functions you'd get in a conventional infotainment system. This is nothing short of fantastic. I won't shock you if I tell you that most of these proprietary systems installed by car makers the world over are cumbersome, complicated, laughably slow and unresponsive when compared to the latest smartphones and tablets, and just generaly poorly executed. For all those who won't be able to afford an iCar, Renault's solution seems to me like the right way to go : instead of a touchscreen with bad software, and hardware you won't ever be able to update, you'll just have everything you need in your smartphone, and everyone has a smartphone these days (Symbian doesn't count). The touchscreen will be responsive, and easy to use because you'll be familiar with it. And you'll be able to update it. Need a bigger screen, more memory, or fancy a change of brand ? Why, you can't do that with most infotainment systems, but you sure can here : just get a different smartphone. This recent race to fit each and every car under the sun with the obligatory 7-inch touchscreen has resulted in a big mess of proprietary systems with user interfaces that'd make any tech company designer blush with embarrassment. Renault have found the best way to fix this : get rid of it all. We've all had everything we need in our pockets for years. Pictures : Renault via Carscoops.